Share this product and receive a $2.04 sharing discount. 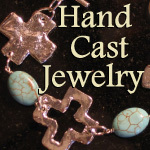 Made with love and meant to bless, these little, Sterling Silver Blessing Bars keep your blessings close to your heart. 1 Corinthians 13 "Love is patient and kind; love does not envy or boast; it is not arrogant or rude. It does not insist on its own way; it is not irritable or resentful; it does not rejoice at wrongdoing, but rejoices with the truth. Love bears all things, believes all things, hopes all things, endures all things. Love never ends." 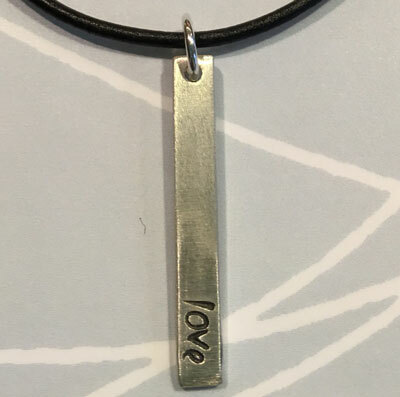 Each 1 1/8" x 3/16" bar is handcrafted in sterling silver and comes hand-stamped on the front with the word listed above. You can choose, for a fee, to add a word on the back, such as name, date, Scripture citation, etc. Limit is 11 characters (lower case letters/numbers/punctuation/spaces). Stamping will be in lower case letters. The Blessing Bar comes on 16" black leather cord with silver clasp. You can upgrade to a Sterling Silver Box Chain above. IF PERSONALIZED ON BACK: Please allow up to two weeks for processing and delivery.